Where I live most of the homes are relatively new since our area is a suburb and has had a lot of growth in the past 20-30 years. The city we live in has had its population double in the past 20 years. Because of this about half of the houses are less than 20 years old. However in some parts of the US theres been much less growth in recent years and/or the housing has been built up nearly 100% for a long time. 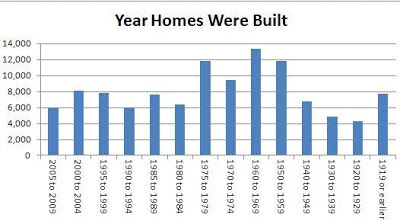 I found the age of homes in the American Housing Survey tables for 2009 data, specifically table 2-1 shows the year the structures were built. Note the data is for all housing including owner occupied and rentals. Now we don't see data for 2010 to 2012 but after the housing bust new home construction ground to a virtual halt and I assume a lot fewer homes were built in the past 3 years. How Balanced is Your Retirement Portfolio?